Final installment of "Hands-On Radio" in the December 2017 issue of QST magazine. 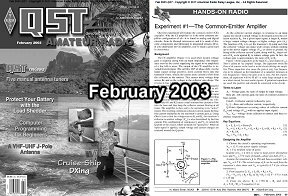 First installment of "Hands-On Radio" in the February 2003 issue of QST magazine. Another era, sadly, has come to an end. 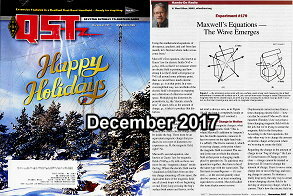 H. Ward Silver (aka Ward Silver, NØAX) has announced the end of his monthly column, "Hands-On Radio," in QST magazine. The title of each column was enumerated as "Experiment #nnn," followed by the subject. To wit, "Experiment #179 Maxwell's Equations - The Wave Emerges" is Mr. Silver's final column, appearing in the December 2017 QST. "Hands-On Radio" topics ranged in intensity from relatively simple discussion on calculating power dissipation in resistors, capacitors, and inductors to more heady treatises on subjects like electromagnetic fields within coaxial cable and waveguide to Maxwell's equations. Mathematics, too often avoided in modern electronics articles, were presented as needed to supplement the story. Other than maybe in Microwave Journal, when is the last time you saw a divergence or curl operation in a magazine article? 179 ÷ 12 modulo 12 yields 14 years and 11 months worth of "Hands-On Radio" columns. Assuming no skipped months of publications, that makes February 2003 the first installment. Checking the online digital QST archives* confirms indeed it was in that issue which "Experiment #1 The Common Emitter Amplifier" appeared. It takes a lot of dedication to the amateur radio cause to produce high quality articles every month for nearly 15 years. Since my first issue of QST arrived after joining the ARRL in 2010, "Hands-On Radio" has been either the first or second column I read each month (Joel R. Hallas', W1ZR, "The Doctor Is In" is the other). Thank you, Ward Silver! Mr. Silver still contributes a semi-regular column titled "The Ham's Wireless Workbench" in Nuts and Volts magazine, so you can still get a regular dose of his sage thoughts. I was a subscriber to the print version when the column, titled "An Intro and Antennas," debuted in January 2015. 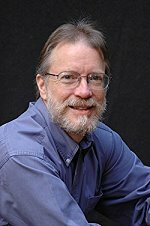 His most recent column titled "Vacuum Tubes" appeared in the November 2017 issue. In addition to all of his magazine column writing, Ward has authored and/or contributed significantly to many books including ARRL license manuals and the "... for Dummies" series. In fact, most -if not -all - of the "Hands-On Radio" columns are captured in a couple books available on Amazon. He is also, as you might expect, very involved in Ham radio events including contesting. We have not heard the end of Ward Silver, that's for sure. * ARRL membership is required to access the digital editions; however, the September 2009 issue of QST is available in its entirety on the nxtbook.com website.